Working with the portal engine in Kentico support the kind of rapid development that bring visible results to the client quickly. In this post, I'll show you how using a combination of Web Part layouts and Widgets allow you to create structured reusable components to add more velocity. Widgets offer your CMS users the ability to add structured content elements to their pages within the Portal Engine in Kentico. As developers, we know that a widget must be based upon a web part. At Ridgeway, we typically create a web part for each type of widget we need. During rapid prototyping, it can sometimes be cumbersome creating multiple web parts to support he widgets that are needed. This is especially so when working in web application projects on a shared database. In this example, I’ll set-up two widgets; one simple CTA (call to action) button and the other, a more visually pleasing CTA banner. Kentico will create the required files for your solution and create the web part in the system. So, we’ve got a simple web part with absolutely no properties whatsoever. Note: If you’re using a web site application, you’ll need to add these files to your project prior to building the solution. 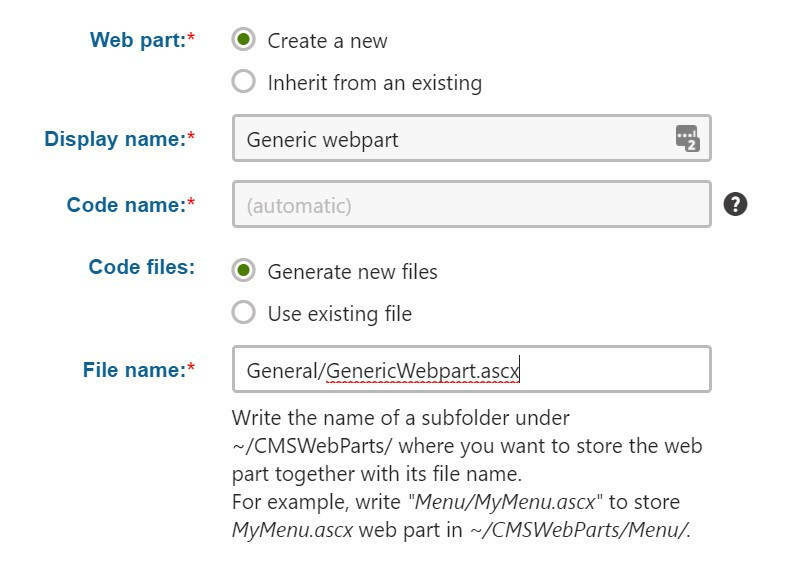 In this example, the files can be found in the CMS\CMS_WebParts\General folder. Now that we have a simple web part, we can take a look at the web part layouts. In this code you can see things like this <%= GetStringValue("LinkTitle", "") %>. Here we are accessing properties that do not exist in the web part, these will be coming directly from the widget itself. Now we have a web part with a couple of layouts we can go about our business and create widgets that our editors can use. These widgets will use the layouts defined above and will also have the relevant properties created in each widget to satisfy the properties requested in the layout. Open the Widgets application and select the General category in the tree view. Click the New widget button and select the General/Generic webpart web part. In the Security tab, make sure that Allowed for is check for the This widget can be used in editor zones. In the Security tab, make sure that Allowed for is checked for This widget can be used in editor zones. This is just a simple demo, but keep in mind that the complexity of these widgets can vary. In one instance over 15 layouts on a web part ranging from CTA though to image sliders. Not all of them need properties, some pull from the context of the page. In example of the slider, looking at an attachment group on the page. This approach is a fantastic way to get some rapid prototyping done without the need to leave the administration pages in Kentico and – in light-weight scenarios – can be a good way to quickly build your site up. Do take note that if you're creating a multi-lingual site, this may not be for you. Widget properties alone are not supported by Kentico's Translation Services, as only the web part properties are available to translation. So, if you're not careful you end up with a bunch of content that you cannot push through translation services.